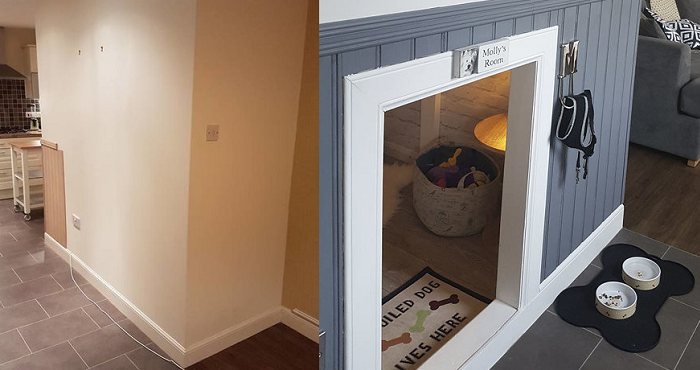 With A New Baby On The Way, This Dog Dad Wanted To Give His Pup Her Very Own Room! Molly had been living a very luxurious life so far, but when her human parents found out that they would be welcoming a new addition to the family in a few months, things had to change. Michael and Emma knew that they wouldn’t have as much time to devote to their adorable pup, so they wanted to make sure that she wouldn’t feel jealous when the time came. 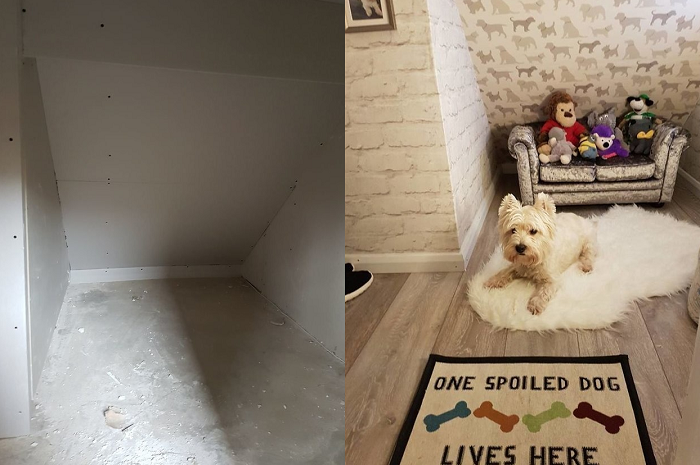 They thought about the best way to reassure their pup that she wouldn’t be forgotten would be to give her a space of her own! They got to work on “Molly’s Room” and the results are incredible. It started off with a blank wall. Michael wasn’t sure what sort of space would be under the stairs, but he hoped it would be big enough for their pup. He made a small hole, and sure enough, there was quite a bit of room for Molly to hang out! He hired a craftsman to advise him on the best ways forward. They put in flooring, new walls, and even a ceiling! He also added power so that Molly would have light inside! Wallpaper, baseboards, a little couch with her favorite toys, a beautiful rug, and a plush dog bed made this room exceptionally roomy! Molly instantly felt at home! When the little baby arrived, Molly didn’t feel jealous! She was comforted by having her very own spot in the house that was all her own!